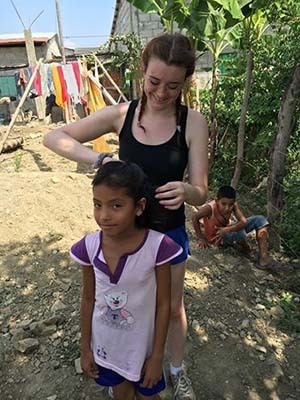 Spanish & Service Learning Program in Ecuador – Greetings from the Southern Hemisphere! I’ve spent the past month as a Canadian exchange student, living, and studying in the beautiful city of Guayaquil, Ecuador. I am currently a Social Services student at NSCC Marconi Campus, and originally signed up for the unique learning opportunity because I wanted to complete a Service Learning program in a different environment. I quickly found that my new reality completely overpassed my expectations. Not only have I had the chance to volunteer at an amazing location, completely unique to anywhere else, but I’ve gained a new appreciate and love for a different culture. The first week was spent completing an orientation, and then it was off to meet our host families. I was initially nervous to find out who I would be living with for the next month and a half, but was quickly reassured the moment I was picked up from the airport. My family has been so accommodating, comforting, and welcoming, and I couldn’t have hoped for a better home. A basic day for me consists of completing three hours at my Service Learning site, and doing two hours of Spanish classes. In-between the work and school, there are many moments I find myself astounded with the fact I’ve been living as an international student in a country completely foreign to me. Whether it’s eating breakfast with my host mom, going to see a movie with my friends, or just riding the bus to my Service Learning site, I’ve tried to not take any moment for granted, and immerse myself in this new lifestyle as best as I can. To sum up this experience I would say it’s been a world wind of new adventures and new realizations that will be carried on with me not only into my aspiring profession, but as memories that will last with me my entire lifetime. I would like to thank NSCC for giving me this amazing opportunity, UEES for being an incredible university to study at, and everyone who has gotten to share this unbelievable experience with me.